It’s simple: H – I – J – K tells the story. Jeopardy– Triple:Debt, Deficits and the Dollar. Debt up, dollar down! Debt and Deficits: The hurricanes will cost the U.S. government and economy many $ billions and increase the national debt and deficit. There is no plan to reduce other spending to compensate. Just borrow baby! Borrow more and more. What could go wrong? Spending is out-of-control, and that was before two Hurricanes and before the U.S. ramps up military spending, more wars, and whatever comes next. Know (Fort): Officially Fort Knox in Kentucky holds 147 million ounces of gold. PRETEND that official story is true, the gold is physically there, unencumbered, not leased out, and not stolen. The 147 million ounces of gold are worth $200 billion dollars – about the losses from Hurricanes Harvey and Irma. That shows how low gold is valued at current prices. In less than 30 days two hurricanes cost about one Fort Knox Gold Unit – the value of the gold supposedly stored there. There has been no independent audit since the 1950s. The INCREASE in U.S. national debt – before hurricanes and a Korean War effort – will be around one $ trillion for this year. That is equivalent to five Fort Knox Gold Units for only this year. We spent many other Fort Knox Gold Units every year for decades. The total national debt at $20 trillion is about 100 Fort Knox Gold Units. U.S. government expenses are out-of-control. 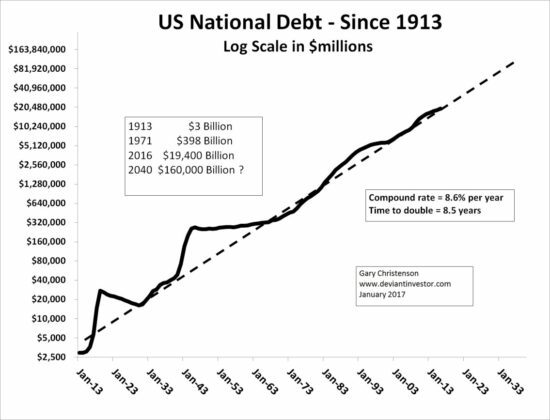 National debt has increased around 9% every year since 1913. Congress and the President want to scrap the fiction known as the “debt ceiling,” which will confirm the U.S. has no intention of managing expenses or reducing debt. Expenses, deficits and the national debt will go up … until a reset occurs. The dollar will decline. If two hurricanes will cost – in round numbers – the value of the gold supposedly stored in Fort Knox, the gold is valued far too low. How about ten times higher? If the U.S. government must borrow a $trillion per year – five Fort Knox Gold Units – just to pay expenses in excess of annual revenues, gold is undervalued. How about five to twenty times higher? The “petro-dollar” has supported the value of the dollar since the early 1970s. Countries that wanted to buy oil on the global market, until recently, had to purchase that oil with U.S. dollars. The demand for dollars was strong and that maintained the value of those dollars. But recently China and Russia have bypassed the dollar for many transactions. Iran, Russia and others will soon sell oil to China and will be paid in gold or yuan. This trend is likely to continue and the international demand for dollars will decline further. If demand for dollars (easily created) declines and the demand for gold (difficult to mine) increases, one can expect the value of gold, measured in dollars, to triple or quintuple within a decade or less. Exceptional needs such as hurricanes and wars that boost spending, hammer the budget, and increase the national debt will always exist. The system has been in place for decades – so Congress likes and continues the process. The system works for the political and financial elite. If gold is so important that we keep it in a massive building (Fort Knox) protected by weapons, mines and thousands of soldiers, why hasn’t it been independently audited in 60+ years? Maybe the results of the audit would be embarrassing. If gold is NOT important, why not dump it on the market and pay for a few months of excessive expenditures as authorized by Congress? Because the pretense of retaining gold is important. If gold is NOT important, why does Russia purchase more each month? Why does China refuse to export gold, purchase more each month, and encourage its citizens to purchase gold? Because Asia and Russia understand what the west refuses to admit – gold is far more valuable than its current price indicates. A reset in the attitude toward gold will come to the west. Asia already understands gold, wants it, protects it, and buys more every month. Gold is important, much of western gold is gone, few in power will admit that debt can’t fund wars, entitlements and pork forever, and a reset is coming. South Texas and Florida have sustained severe damage. More economic damage will come to the middle class of the U.S. as a consequence of massive debts, dishonest money, fiat dollars, and our confused and contradictory attitudes toward gold. Gold prices have moved upward through $1,300 and will probably correct somewhat, but higher prices are essentially guaranteed.